The ultimate slide gate motor offering countless cycles of trouble free operations. All steel construction in 5mm galvanised steel and a stainless steel cover offer the highest standards available. Specification options include selectable start, run and stop speeds to 800mm / second or a 196KG start force with a 326KG lock force, uninterrupted power supply (UPS) and logic interfaces for integration into the particular building's fire alarm control. Featuring a brake motor with a selectable gearbox configuration and control the units provide unlimited performance flexibility and a capacity to provide a solution for every conceivable sliding gate application. 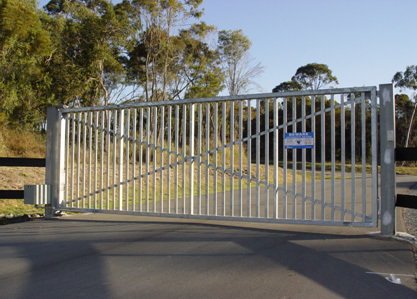 The ultimate barrier gate offering countless cycles of trouble free operations. All 3mm aluminium cabinet construction offer the highest standards available. Specification options include PLC's, selectable control of start, run and stop speeds, uninterrupted power supply (UPS) and logic interfaces for integration into the particular building's fire alarm control. The internal gear reducer provides positive locking. The units featuring selectable motor and gearbox configurations for boom arms to 6metres, extremely robust motor, limits, and cams. Without doubt the units provide unlimited performance flexibility and a capacity to provide a solution for every conceivable barrier gate application. The ultimate swing gate motor offering countless cycles of trouble free operations. All steel construction up to 5mm galvanised steel and a stainless steel cover offer the highest standards available. Specification options include selectable control of start, run and stop speeds, uninterrupted power supply (UPS) and logic interfaces for integration into the par ticular building's fire alarm control. The harmonic arm action providing inherent geometric speed control and positive locking. The units featuring selectable motor and gearbox configurations (190-460Nm torque) extremely robust motor, limits, cams, bearing and clutch pads. Without doubt the units provide unlimited performance flexibility and a capacity to provide a solution for every conceivable swing gate application. The Cable Gate offers an ideal alternative solution to a barrier gate.. This product, winner of the Engineers Excellence Award for 2004, is a quality product on which you can depend. Built to last the unit features strong compact mechanical components and permanent lubrication suitable for all commercial, industrial, retail centres, hospital, caravan park, unit complexes, strata plan developments and offices. 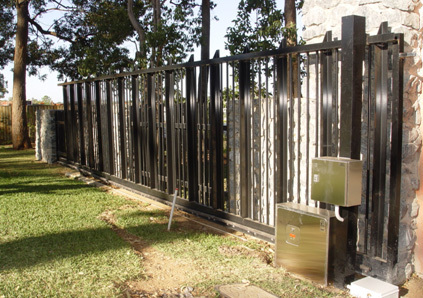 The Cable Gate is operated by rechargeable batteries that are connected to either a mains power supply or solar panels. The batteries offer operation in the event of a power failure. The Cable gate can secure entrances from 4 to 8 metres without the need for additional headroom required by a barrier gate. A stainless steel cable is securely locked between two steel posts, that are zinc plated and powder coated, and provides an opening time of a 0.5 seconds and closing in 7 seconds.. A heavy duty 24VDC motor draws the cable up and locks it securely over a stainless steel latch.